These temporary works were completed during the major new construction and expansion period in the prestigious financial district of Heron Quays, Canary Wharf. DAWSON-WAM supplied and installed an inventive temporary bridge solution to alleviate the areas traffic problems by utilising its Modular Bridge System. The bridge layout was a challenge to the DAWSON-WAM's design and build team as the layout (including a 90deg. bend) was far from simple and access was severely restricted due to the location and vicinity of existing structures. The works were also completed under challenging time restraints imposed. The foundations consisted of driven 610mm dia. tubular piles up to 20m in length penetrating deep into the stiff London clays. 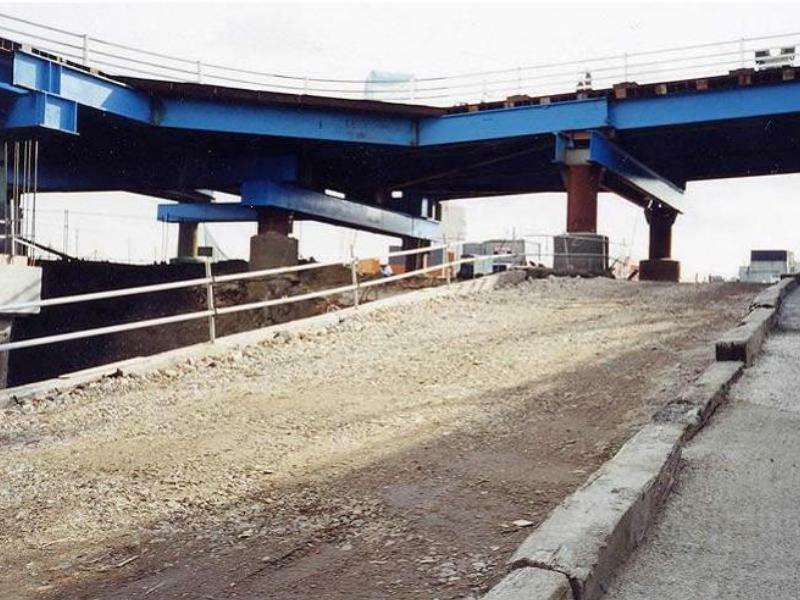 The bridge deck comprised 12m twin steel bridge beams and steel deck mats. The steel deck mats were coated with a slip resistant running surface to highway standards. The bridge was used to carry two lanes of highway traffic for a period of 12 months before being dismantled and removed by DAWSON-WAM.